I have a love-hate relationship with seagulls. Living by the seaside, as I do, I would not be without the herring gulls’ screeching call to remind me where I am. But they are aggressive, thuggish birds that do not think twice about attacking old ladies and children with chips and ice creams, so I prefer to keep them at arms’ length. 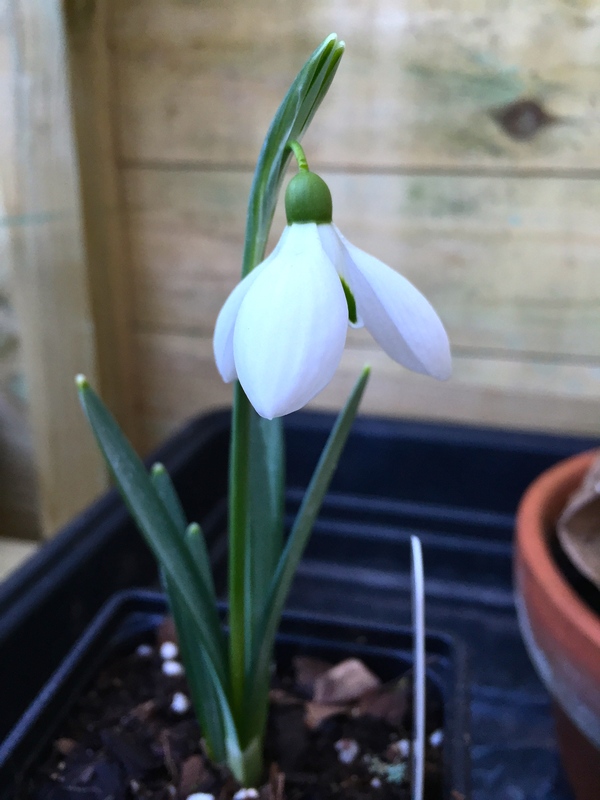 Despite my reservations about these winged villains, it was a snowdrop going by the name Galanthus ‘Seagull’ that tempted me to part with £20 on Sunday. For that princely sum I acquired one beautiful specimen, complete with black plastic pot, compost and label. Spending that much on a plant comes with quite a sense of responsibility. For the foreseeable future Mr Seagull will remain in solitary confinement, holed up in the relative safety of my new, miniature greenhouse where his flowers can’t be splashed with soil, or the bulb chomped by squirrels. Unlike the flighted version I doubt this particular seagull would survive for long in the wild, and for now I prefer to keep it where I know it can’t upset old ladies or children. Wow. Is it the light that has tinged the petals lilac or are they really that colour? Either way it’s a beauty. Burpee does offer this bulb for sale, unfortunately it is sold out. Don’t worry about the hardiness of Seagull. My solitary bulb has now formed a sizeable clump it a bed that gets very dry in summer and wet in winter by my front door. I have just started to split up the clump to spread around and pass on some to a friend. The bulbs are huge, more akin to a bluebell! They grow very tall and large flowers for a snowdrop, which is what attracted me to them, as when they flower I view them from a distance, not up close on my knees.